Dragos NEAMU is the founder of National Network of Romanian Museums (2006). He has a long experience in both museums and project management as well as in discovering and empowering creative and smart people from the museum community. 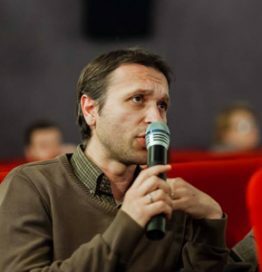 From 2005 until now he worked and managed various national and European projects mainly for the network’s members benefit but also as freelancer and activated new fields of actions in Romanian museology. The museums network he represents became one of the top NGOs organizations in Romania and is deeply involved with the National cultural policies and strategies, advisory boards and working groups dealing with financial programmes for cultural sector, legislation and assessments. In 2012, he coordinated an extensive working group of the Ministry of Culture aiming to cast an official and detailed socio-economic analysis of the contribution of heritage and cultural and creative industries to the national development as a part of the Governmental strategy proposal for the next 2014-2020 financial framework (Structural Funds). In 2014, Dragos became a member of the Network of European Museum Organisations board. For 2016, he was appointed Advisor to the Minister of Culture for museums and creative and cultural sectors. He is also part of the European working group dedicated to innovation in cultural business models and entrepreneurship.